An open letter for assistance. With the feet of snow starting to recede, thoughts in the Seacoast can finally move to spring and the coming summer/tourism season. That also means the return of over 100 J-1 Visa foreign workers needed in the area’s hospitality/dining industries. 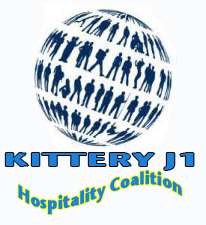 The Kittery based Seacoast J-1 Coalition is once again looking for assistance in the areas of housing, transportation, and cultural experiences. Housing means available apartments and rooms for a four-month period commencing in early June. Rental payments are usually weekly. Seacoast residents who may be able to offer such are asked to visit www.ourkittery.com and click on the J-1 link. There you will find a listing of agencies who typically place students in the Seacoast. Please contact any one of them — they need help in their mission to find students affordable, safe housing. Transportation needs come in two forms. Bicycles are the main form of travel for these students. If you can donate a bike in good working condition, please drop it off at the Kittery Freebie Barn at the Resource Recovery Center. Bicycles are rented to the students for their stay at a nominal fee. Please make the volunteers aware of your donation and they will take it from there. Students also need car rides to grocery shop and do other minor errands. If you would like to volunteer your services in this way — an hour a week — please fill out the “I can help form” on the ourkittery site and we will be in touch with you. Lastly if you could assist in showing these students our beautiful Seacoast on their (infrequent) days off, please fill out the “I can help” form and a representative of the Coalition will contact you. With your help, we can show these students the positive, welcoming side of America. Thank you. This entry was posted in General Town News on March 20, 2015 by Chuck Denault.